The Kazakhstan national carrier, Air Astana, is upgrading its flights from Frankfurt to Astana from the older Boeing 757-200 models to the Boeing 767-300ER aircraft. The carrier took delivery of B767-300s some time back and initially used them on the route from Frankfurt. At that time this was hailed as a new start for increased belly cargo capacity to Astana and beyond. Putting the B757-200 back on that route did not help the sales department of Air Astana in being able to promote the airline’s cargo product. Although flying the sector Frankfurt-Astana only takes just over five hours, the B757 pax version has a very limited belly capacity. The airline plans to operate daily from Frankfurt with their updated B767’s starting as of 15. May. Extra comforts for passengers in both the Business and Economy classes have been introduced whereby the cabin has been redesigned in lighter colours and new seating which are said to offer more space and legroom. The cargo market to Astana has picked up considerably these past years thanks in part to the increasing oil and gas industry as well as the import of machinery, chemicals, luxury goods and the like. The B767 with its almost 15 ton belly payload is a welcome break for the Air Astana cargo department. The average five hour sector eastbound and 6 hours westbound should not give the carrier much problem in achieving maximum payloads. 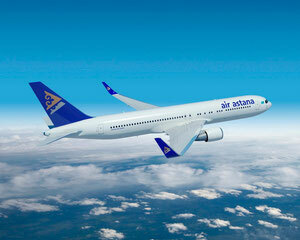 On average, this would give Air Astana around 80 - 90 tons eastbound capacity per week.